As a freshman, the anticipation for the infamous block party was a mix between absolute excitement and pure terror. There is no way to describe the amount of conversation that revolves around block party during the week before it happens. T-shirt sales, alcohol purchasing, and prayers to the rain gods is all one hears. Everyone talks about drinking more than they have ever drank, and going harder than they have ever gone. Meanwhile, daily emails were sent out urging kids to be safe. 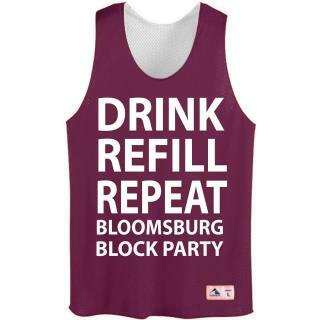 Talk about the National Guard coming, as well as all of Bloomsburg police patrolling the streets is enough to make any freshman aware that block party is no joke. A normal Saturday morning in Bloomsburg everyone appears to be nocturnal. Not this Saturday. The commons was filled by 10:00 am by students dressed in their block party apparel, ready to enjoy the surprisingly nice weather. Every person was paranoid about being stopped by a policeman before arriving at his or her destination. But the amount of police present was underwhelming in comparison to its build up, “All the hype leading up to block party made me expect to see cops in every direction, but it really wasn’t that bad,” says one freshman, Erin Thompson. A few police cars driving by and a distant helicopter making its rounds were all that the lucky ones experienced. Many of the parties were very similar to any Bloomsburg frat party, except this time there was a performer, the DJ had a microphone, and it was outside. Oh, and a man from Papa John’s had his own pizza station. On block party it is very important for parties to follow regulation, so having a gate surrounding the lawn, porta-potties, dumpsters and a permit pretty much ensured that the party is safe. Many frats were selling wristbands weeks before block party to keep the party exclusive and under control. Weather was a concern, but it did not stop Bloomsburg partiers. When the rain eventually came, everyone made the best of it. Some parties were lucky enough to have a tent and ponchos, not that it stopped people from dancing in the rain. By 5:00 p.m. everyone was drenched and drained. Nevertheless, many continued to celebrate block party straight into the night. Some freshman learned that there actually is a way to enjoy block party safely, while others were not as lucky.